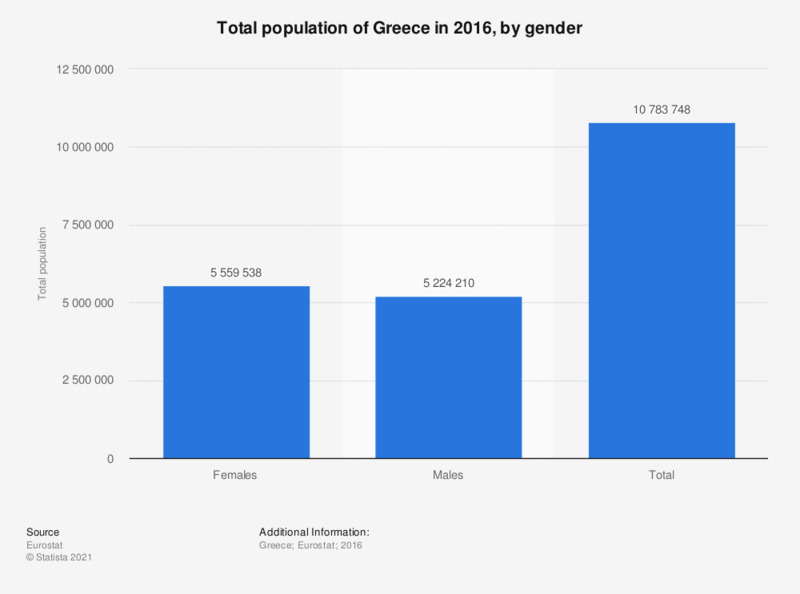 This statistic displays the population of Greece by gender in 2016. In this year there were a total of 10.78 million inhabitants in Greece. There were almost 5.56 million female inhabitants, whereas there were less than 5.3 million male inhabitants. These summary metadata refer to the first results on the main demographic developments in the year of reference. The first results on the main demographic developments in the year of reference (T) contain the total population figure on 31 December of year T (further published by Eurostat as Population on 1 January of year T+1), and total births and total deaths during that year. While submitting this data is a legal requirement from EU Member States (EU Regulation No 1260/2013 on European Demographic Statistics, which entered into force on 1 January 2014), countries submit on voluntary basis data also on immigration and emigration that occurred during the course of the year (T).